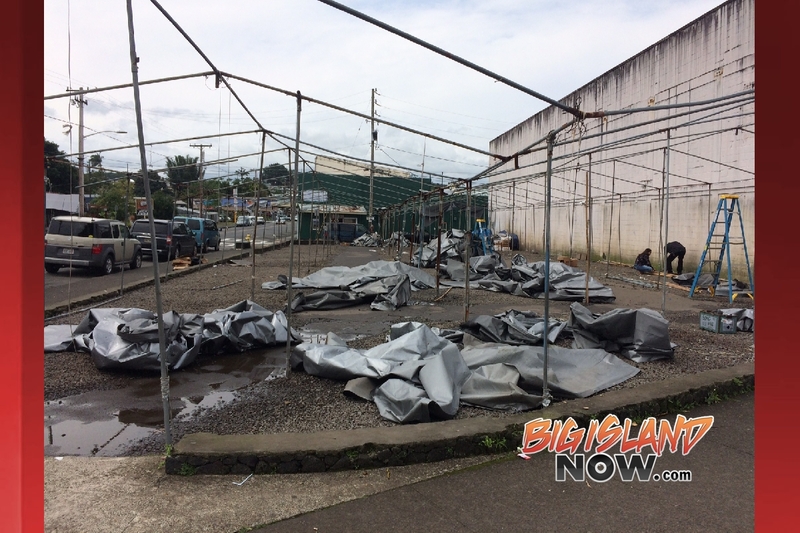 Tarps removed from the Hilo Farmers Market. 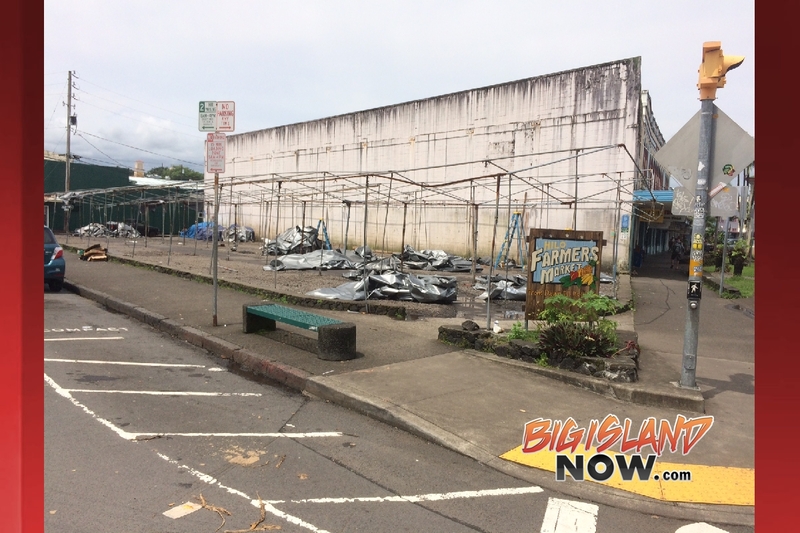 “The information out there regarding the closure of the Farmer’s Market in Hilo is so wrong and misleading that it prompts this open response,” said Mayor Kim. “The public should know of truth that their government has sincerely tried to help Mr. De La Cruz comply with the county, state and federal laws to keep the market in operation. A commitment was made and kept by the county to help keep it open and develop a place to be proud of. The choices made that caused this closure and hardships imposed on the tenants were not made by your government. The Hilo Farmers Market is an important part of downtown Hilo. It has been successful due to the diversity and freshness of the offerings of its vendors. The county has tried to work with the owner for years to bring the properties into compliance with building, fire, and zoning codes. The conditions were allowed to persist for all these years in deference to constantly changing plans proposed by the owner. Continuous efforts over the past year by the county to guide the owner into compliance were unsuccessful due to delay or no action on the owner’s part. The only way to finally achieve results was to enforce the notice of violation that the owner received in June of 2017 which clearly stated the consequences if the proper permits were not acquired in a timely fashion. This enforcement was done in fairness and responsibility to all others who follow county, state, and federal requirements. No building permits. The Farmers Market has been operating for over 20 years without any building permits. Temporary structures, such as large tents greater than 120 s.f., used for commercial purposes are required to have a temporary building permit which is good for 180 days only. Non-flammable tent material. Tents larger than 750 square feet are required to have non-flammable or non-combustible tent material. The Fire Department reviewed and approved proposed tent material. The owner just had to place the order. Non-permitted electrical wiring. Electrical wiring was energized, used, and operated without required electrical inspections and approval of electrical work performed. Extended hours of operation. Farmers Market operations exceeded two days a week as limited by Special Management Area Minor Permit No. 54. Non-permitted sign. A large sign was installed without acquiring the required permits. No setbacks between tents and property boundary. Temporary structures are required to have a 10 foot setback from the property boundaries and 10 foot spacing between tents. The owner had 10 years to construct a permanent structure as required by SMA approval. The deadline of March 2018 has not been met. The farmers market owner initially received Planning Department approval for a permanent structure in 2008. A condition for approval required completion of construction within five years. In 2013, the owner requested an extension for another five years. The extension was granted with a new deadline of March 18, 2018. Meeting with the Mayor. On Jan.31, 2017, and Feb. 17, 2017, the mayor met with the owner to determine the status of plans to meet the March 2018 deadline and offered assistance to facilitate development. The mayor assigned an executive assistant to work with the owner. Issues Identified. The executive assistant coordinated with various departments to identify the types, sequence and estimated processing time of permits. 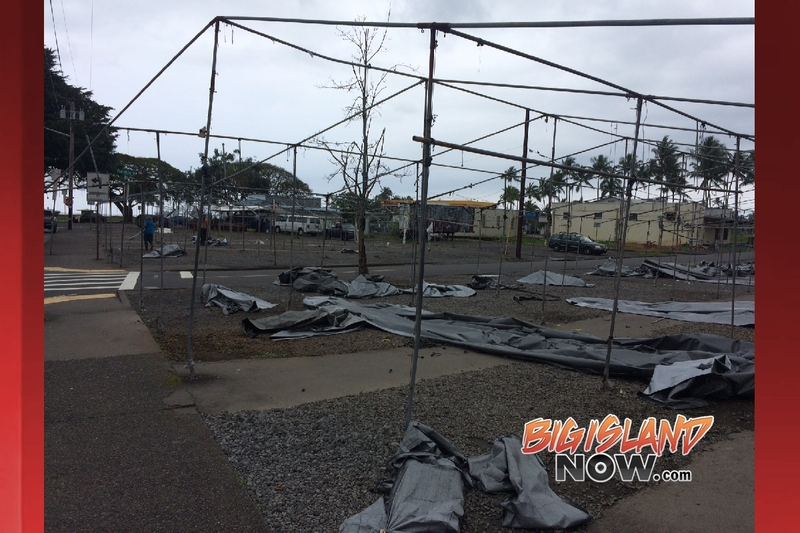 Since the farmers market is located in the special flood hazard zone exposed to tsunami and high waves, one major issue was how to comply with these strict standards. Working with the Department of Public Works, a feasible solution was determined that allowed for a simplified structure. Schedule and Budget. The executive assistant helped the owner to assess how much the owner could finance to design and construct a permanent structure based on the substantial total annual rent income the owner receives from the vendors. Additional help also identified steps to start construction of a permanent structure including development of a schedule to meet the March 2018 deadline. The schedule required prompt action by the owner. Hire an architect to design a permanent structure and prepare the building permit application. Secure financing for design and construction. Apply for amendment to SMA permits for preferred hours of operation and revised design of structure. Secure Plan Approval for commercial operations. On May 24, 2017, the mayor and several departments met with the owner to assess his progress. Despite assurances from the owner to carry out critical tasks identified in the last meeting, it became evident that the owner made no progress. Consequently, the county issued notice of violations in June 2017 requiring the owner to obtain temporary structure permits or submit plans for a permanent structure. The assessed fines for violations and failure to meet deadlines were clearly outlined in the violation notice. Three time extensions were granted over a 6-month period through Dec. 31, 2017, to provide time for the owner to comply. At the end of December 2017, the owner submitted applications for temporary structures. These permits were approved but the owner has not picked up the approved permits. To motivate action, the only recourse was to issue an order imposing fines as declared in the June 2017 violation notice. 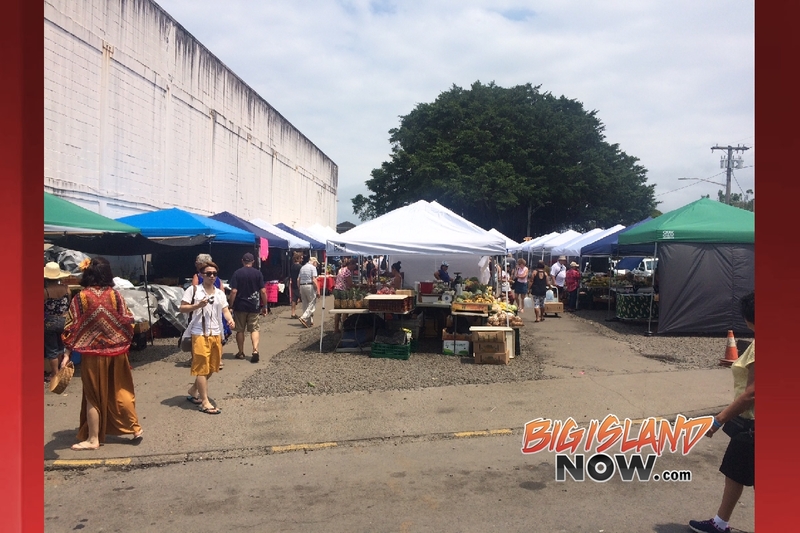 The County of Hawaiʻi has worked closely with the owner and made numerous efforts to help preserve the Hilo Farmers Market and bring it into compliance. It is incumbent upon the owner to continue to work with the county in a timely manner to secure the necessary permits to operate his business. 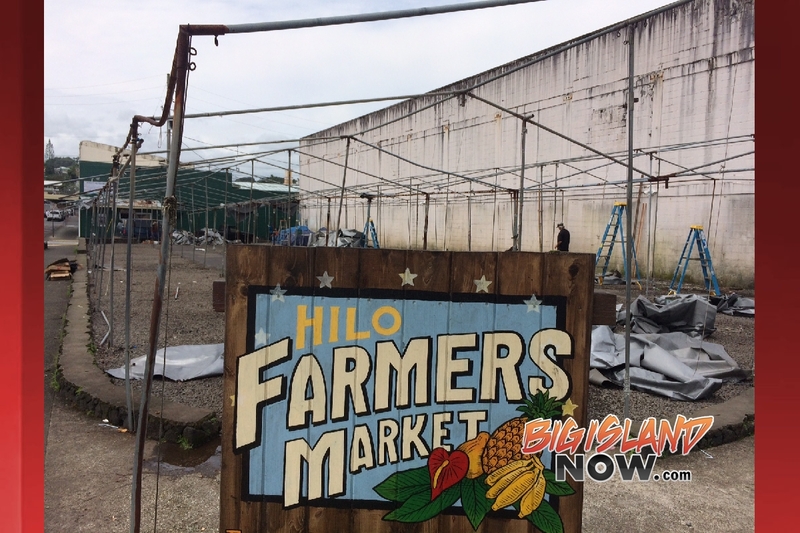 The county is committed to assisting the owner in developing a permanent farmers market that can be a fixture of the Hilo landscape, provide a safe environment for the community to shop and help make Hilo a beautiful and nice place to live. 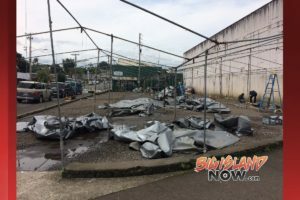 Despite county orders to the owners of the Hilo Farmers Market to take down their tarps and tents or face a $4,000 fine per day for being in operation, Big Island vendors are continuing to support the market location. Many have already begun to sell their goods again in their own private pop-up tents. 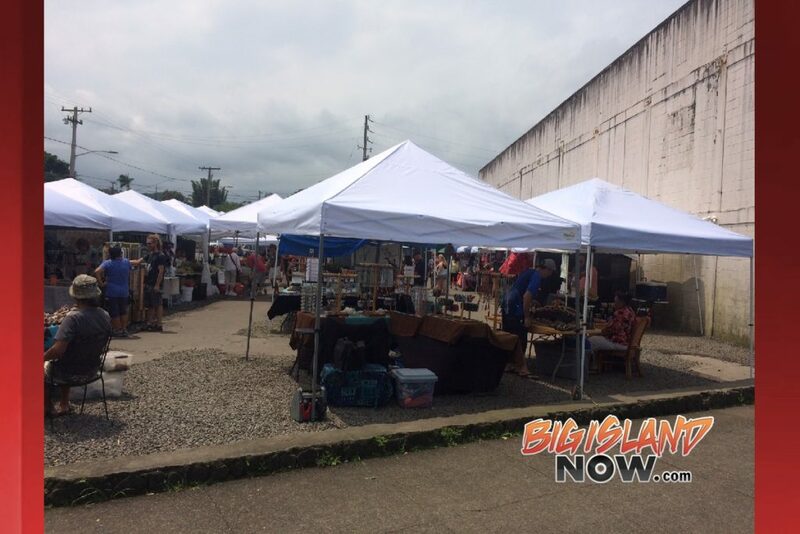 New look to Hilo Farmers Market. 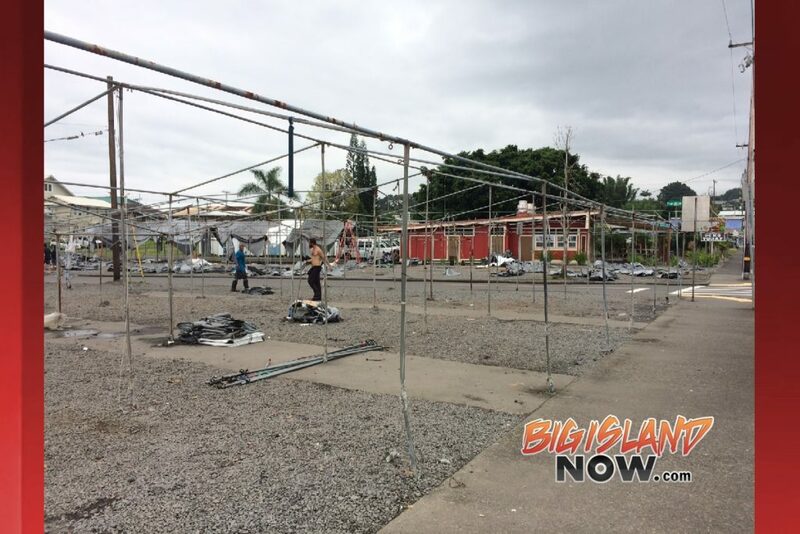 Many residents on the Big Island were shocked to learn that the Hilo Farmers Market was forced to take down their tarps and tents that have been a Hilo mainstay for over 30 years. Hawai‘i County Mayor Harry Kim said that he had tried to work with the market over the years, but finally, the county had to shut the location down and on Sunday, March 25, 2018. Poles and tarps were removed. Vendors were upset with the short notice given to them; however, many have gotten over the shock of the idea of not having a permanent tent and have already gotten use to using their own 10-by-10-foot pop-up tents. While the vendors can set up any day of the week, the market has traditionally enjoyed its largest crowds on Wednesdays and Saturdays. The County of Hawai‘i has ordered Hilo Farmers Market to remove the tarps and the tents that have been its primary structures for over 33 years or face $4,000 in fines for each day they remain in place. The market plans to remain open; however, vendors will need to provide their own pop-up tents. The market owner would still like to process its permits for tenants and a permanent roof. Those application processes are ongoing. Del La Cruz has been trying to secure financing for a permanent roof; however, the economy has made it very difficult and the order to take down the tents does not include any assistance in securing funding. Hilo Farmers Market: the end of an era. Del La Cruz doesn’t know if any notices have been given to any other farmers markets on the island. Huffington Post today listed their picks as the “Great U.S. Farmers Markets” in America. Hilo’s Farmers Market was ranked eighth in the country!